Last Monday evening, my world was rocked; I had just sat down to watch a movie with friends when I received a call that was absolutely devastating. My heart broke as my sister, through her tears and slow sobs, barely managed to tell me the news that the doctors were not sure whether my newborn niece was going to make it through the night. Rewind back to Sunday afternoon, and I’m telling everyone the news that I’m officially an aunt—most of them I’ve never met and could probably care less—but I told them anyway. I was beaming and showed her photo to everyone even remotely interested. Most babies are cute, but there’s something about a new baby that is yours, or at least belongs to someone in your immediate family. It killed me to not be there for the birth, but my sister lives out of the country, and I had decided to stick to the original plan to visit at Thanksgiving. That way, I’d have more time to spend with them. Now fast forward to Monday again. The prognosis was that my niece’s lung had collapsed, and she was no longer stable. Being thousands of miles away from my family, I’ve never felt so helpless in my life. The first thing I did was to get on my knees with my friends and pray. I wept for my sister and the hurt she was experiencing and felt sick that I could not physically be there for her and my family when they needed support. After we finished praying, I started looking at flights to leave first thing the next morning. If that night taught me anything, it was that when something happens to your family, nothing else is as important in that moment as supporting them and standing next to them. If all had gone as planned, I would’ve been there early the next day; however, my flight was delayed. As I waited in the airport, the responses to our prayer request started flowing in. My family and friends had asked people to pray, but we had no idea the magnitude of the number of people who would care about one tiny life. Hundreds of people around the world, some we had never met, began praying. I’m serious; I’ve never witnessed so many people concerned for one person’s life. All of these factors tell me three things: first, people value life. Second, our lives are not just about us. We affect the people closest to us more than we will ever know. Third, family members want to share in one another’s pain. No matter how hard it is to watch them suffer, they want nothing more than to be by their side as they carry the load together. That said, I witnessed a miracle this week. Within hours of people starting to pray, God inflated my niece’s lung. As the week progressed, I witnessed God’s healing as her body began to make a major turnaround. Monday was supposed to be her last day on earth, and now here we are a week later, and she is no longer on any machines. The doctors are saying she should be able to come home within the next couple of days. After witnessing the healing of my strong, amazing phenomenon of a niece, I was overcome with sadness on the flight home as I read in an inflight magazine that an Oregon woman is planning to end her life at the end of the month. 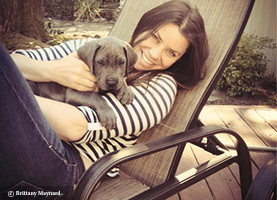 Brittany Maynard has spoken out about her “right to die with dignity at 29.” Brittany has been diagnosed with brain cancer and has received the news that there is no treatment that will save her life. She was given less than 6 months to live and to make certain her family “didn’t have to watch her go through suffering,” she has chosen to end her life soon after her husband’s birthday on October 26. She said that assisted suicide is a way for her to die peacefully and with dignity. Brittany, I know that I’m not in your position, and I know that I don’t personally know you or understand the difficulty of your situation. I can’t pretend to know the emotional and physical pain that you are going through right now. But one thing I do know is that even as an outsider, I love you and value your life. I think that your family would agree that even if you lost everything that makes you “you” in the world’s eyes—things like your hair or even your mental capacity—you still have a soul and that is the real you. There is a famous quote that says “[y]ou don’t have a soul. You are a soul; you have a body.” Our bodies will all eventually fail us. Dying with dignity is fighting to stay alive until God has the final word. There may be no “treatment” that is of this world, but there is a God who is not of this world. He created every cell within your brain, and if there is anyone who can heal it, it’s Him. Who are we to say that He can’t or won’t? I witnessed a miracle this week. Who is to say that you won’t either? Even if you aren’t healed, your time that you have been given is important. Your life has a purpose; you were created by a God who loves you—He was there and hurt with you in the moments when you’ve experienced the most pain. He doesn’t enjoy that you are hurting, and sometimes it’s difficult to understand why some people go through harder circumstances than others; however, He didn’t have to give any of us life in the first place. Each day is a gift. That phrase might sound cliché and overused, but literally every minute has been given to us. We’ve done nothing to deserve it. Why is it that we fight so hard to save a life like my niece’s but then pay little attention to end of life decisions? We treat death as if in some way it is our right to decide? We need to stop treating life as a transaction without purpose. Our bodies are not our own, we were created to live for our Creator and to experience His love for us. God doesn’t promise us that life will be easy—in fact He tells us that it will probably be very hard. But He did say that He is right next to us and has a purpose for every situation that comes our way. As a mother, my sister said that Monday was the worst day of her life. She felt utterly helpless when doctors told her the news that her baby might not survive. How many moms who have lost a child would give anything for one more day with their daughter or son? Brittany, I know that your mother is supporting your decision, but I’d argue that deep down she would go through any type of suffering to spend another moment longer with you if she could. She doesn’t want to see you in pain, but if there’s a glimmer of hope—which I know there is from the miracles that I’ve witnessed in the last week—there is hope that God may heal you as well. Even if He doesn’t, He can use you even in the last seconds of your gift of a life to make a difference in the world. When I say world I mean it—you have such an opportunity in this moment as the world is literally watching your next step. If I could guess what God would say if He were to speak directly to you right now, I think He’d say that He’s got you. He’s been there with you through this whole process and will continue to strengthen you if you’d choose to go through it with His help. He will comfort you, give you peace in the struggle, and ultimately use you for so much good in the lives of those watching you. I plead with you; it is not too late to choose life.